JobLingo products are designed to put you in control of your own exclusively branded, online job readiness program of services. Website pages are customized with your school, agency or non-profit logo and managed by site facilitators that you authorize. Based on a job readiness strategy designed to clearly establish an employment advantage for your students or clients, positive outcomes will soon drive adoption of program expectations within your culture and community. The JRA™ is a comprehensive online assessment of the savvy knowledge, skills and motivation necessary to gain and maintain employment regardless of age, education or experience. It can be used as a pre/post-test for benchmarking training results and as a stand alone tool for coaching personal development. The 20-minute process covers seven crucial areas of job readiness preparation (see graphic). 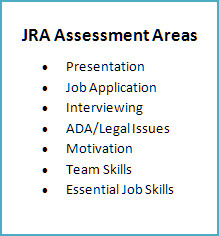 The JRA process effectively and efficiently identifies and qualifies job barriers and weaker performance areas while reinforcing areas of personal strength and skills necessary for workplace success. Used since 1997 with diverse populations, the JRA creates the necessary angst for learning subject matter all too often plagued by the four most dangerous words in our vocabulary, “I already know that.” Uniquely designed as the first step for any job coaching scenario, the JRA quickly becomes the go-to tool for establishing a baseline of services. Showcasing additional value in ease-of-use for facilitators, the dashboard-driven JRA homepage provides at-a-glance real-time scoring and PDF report options for both a long report to use for coaching, and a short report for case management files. The optional integrated Mock Interview module reviews commonly asked questions and outputs a customizable 9-page report. 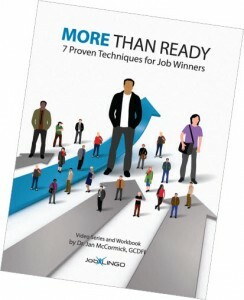 More Than Ready (MTR) is a web-based, micro video lecture series and workbook introducing preparation and practice exercises for winning jobs and opportunities. Designed for job-winning success, training includes 12, 5-minute online videos and a 48-page workbook of hands-on exercises and learning activities. Participants can follow along with a class to complete required projects or work at their own pace using the online Word® templates. Practice exercises can be done in class or with a friend or family member. Certified JobLingo Trainers track individual progress using checklists for each target protocol. 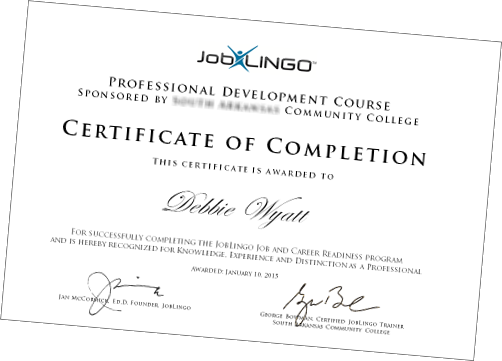 Once requirements are met, participants are awarded a JobLingo Certificate of Completion to validate knowledge acquisition and professional performance distinction.